We are starting with the introduction to creo. This post is also helpful for beginners to start with CREO. 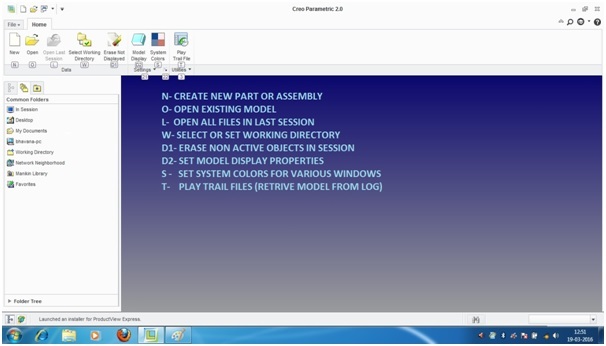 If you have just installed CREO then start CREO with Creo Parametric 2.0 shortcut on desktop or from Start>All Programs>PTC Creo>Creo Parametric 2.0. Image 1 shows start-up window with Alt key shortcuts. Start-up window contains File menu, Home Tab, left side pane is for common folders and favourites. Common folders have different folder shortcut like In Session, desktop, My documents etc. Just click on shortcut and it will expand explorer. Home menu contains important shortcuts from categories Data, Settings & Utilities. Use of these is shortcuts mentioned below. New- To create new creo file. New part, sheet metal or assembly model or drawing. Open- To open existing model or drawing. Select Working Directory- It sets working directory for your current work. You must know that you have to save all models, assemblies and drawings in same folder. Erase not Displayed- This will erase closed objects in current session. Model Display- This shortcut lets you set model properties like default model orientation, model display setting while reorientation model, shaded model display setting. System Colors- You can set system colors with this setting. You can set default colors for graphic window, datum’s, sketcher etc. Play Trail File- This option lets you retrieve the model from last or any session failure for whatever the reason is. You just need trail file which is generated automatically for that session. Template marked in image2- open part model. To create Assembly model select type Assembly and sub-type Design, as shown in image4- open assembly model. 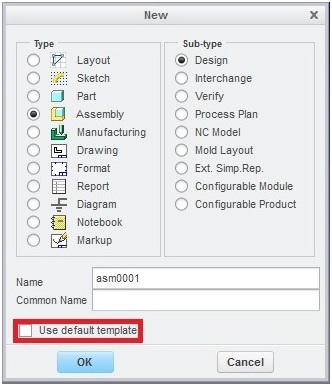 After selecting desired part type, if you have unchecked use default template, new window to select desired template appears, as shown in image5 select desired template. This template lets you define working units like length units mm, inches weight units like kg, N or pounds. You also can change these units after creating the model. 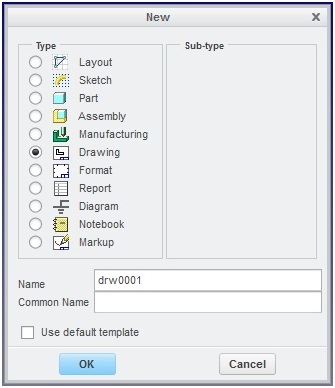 If you have checked the use default template box from new part or assembly window this will directly take to part or assembly window. And the model will load in default unit template which is inlbs_part_solid or inlbs_asm_design. 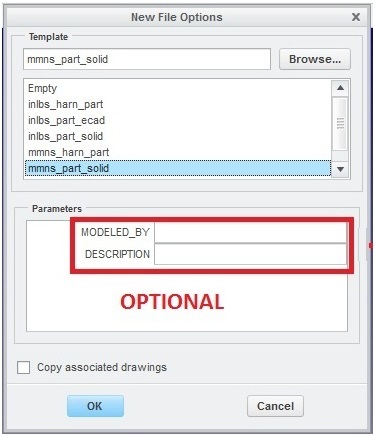 You can select mmns_part_solid or mmns_asm_design for mm units. 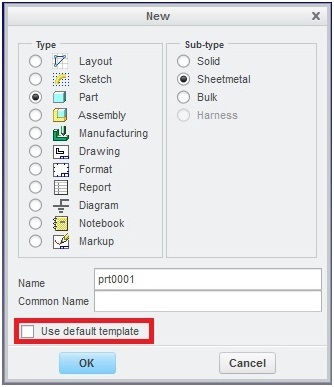 To create drawing just select Drawing from type and uncheck the option use ‘default template’ give name to file and click OK, as shown in image6- create drawing. Empty with format: choose your custom format created by you. Empty: you can also select empty sheet with no template. Choose orientation and desired size while selecting empty template option. Please note default model while creating drawing is your active/working model. You can set your desired model with Browse button. This button will open working directory, here just choose your model for which you want to create drawing, just like opening a model. And finally click OK to create drawing. You can also change your desired sheet size or template anytime while working with drawing which we will discuss in lesson working with drawing. Always give same name for drawing as part name. If you have created a part with desired name and you have not saved the model, you cannot use that name until that part is active in session. To choose that name again you have to clear that part from session, this can be done with Erase Not Displayed option, which is available in File>Manage Session>Erase Not Displayed or at home screen of creo parametric.